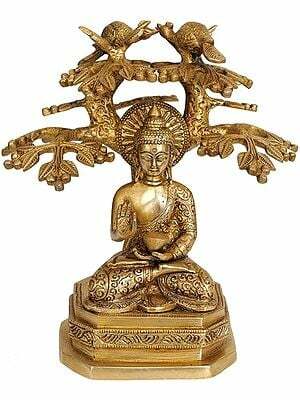 At the age of 35, on the night of a full moon, Buddha attained enlightenment. As he was alone with no one to endorse this momentous event, he called the Earth itself to be his witness by gently touching the ground with his right hand in a gesture known as the Bhumisparsha mudra. 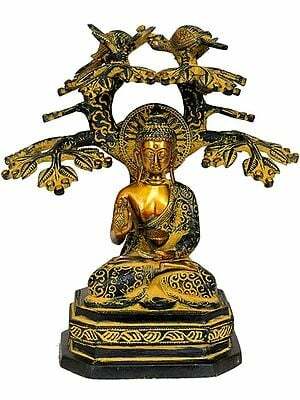 It is well known that Buddha attained enlightenment under a tree. 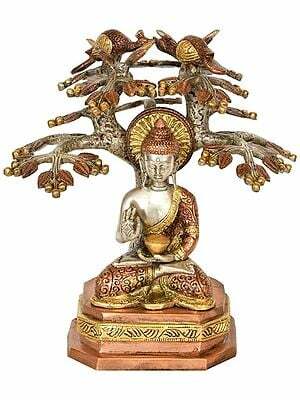 In popular parlance it is known as the bodhi tree or 'tree of knowledge.' 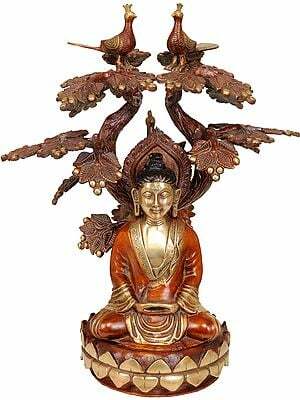 It is not without significance that Buddha found grace under a tree. 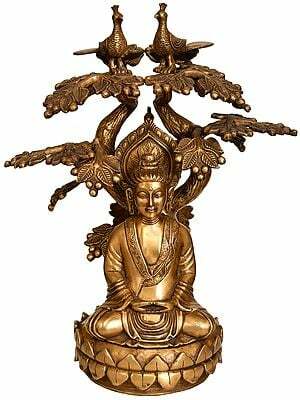 The tree, with its annual renewal of foliage, reminds us of life's continuity and suggests that Buddha was that day reborn (spiritually), as each of us will be on our own day of resurrection (Unless a man is born again, he cannot see the Kingdom of God (John 3: 3)). The tree of life is a common feature of salvation mythology and is said to be standing at the axis of the cosmos. It is the place where divine energies pour into the world, where humanity encounters the absolute, and becomes more fully itself. 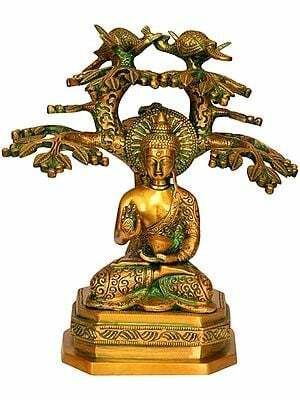 Buddha, as an incarnation of god, is himself the navel or axis of the world, the umbilical point through which the energies of eternity break into time. More than a physical point, this is a psychological state which enables us to see the world and ourselves in perfect balance. Without this psychological stability and this correct orientation, enlightenment is not possible. The tree of life grows throughout the world as the principal symbol of cosmic centering and regeneration. Continually reborn through its seed at the world axis, its root thrust down through the earth to the underworld, its trunk rises through the world, where it grasps everything in its immeasurable arms, and its crown glances heaven. 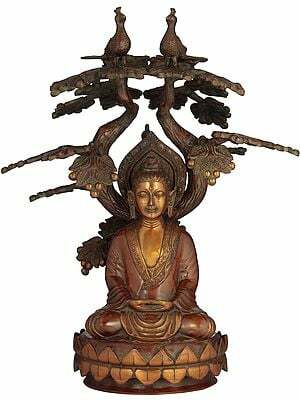 Here, seated on an auspicious lotus base with inverted petals, the would-be Buddha sits poised on the verge of enlightenment. He wears a monastic robe covering only one shoulder. 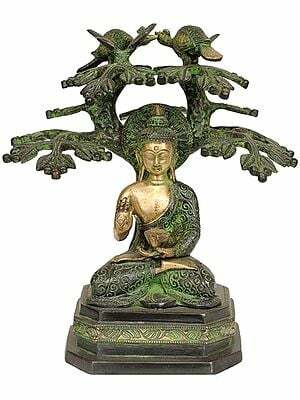 The folds of the drape are realistically and symmetrically delineated and the garment is bordered with decorative vegetative motifs complementing the majestic tree of life shielding Buddha with its high, blooming branches, lushly populated with densely packed leaves. At the apex can be seen two mating peacocks, symbolizing the union of wisdom and compassion which ultimately leads to Nirvana. Having realized that the desired goal was inevitably near, a tranquil smile of contentment escaped from the lips of the Buddha and his whole body glowed with an inner light of an almost unearthly luminosity. The sculptor has been eminently successful in representing these two characteristics.